After having a bit of success with Calvin’s pigeon cake, I am on the hunt for some fun things to do in the kitchen. No, we don’t have any more birthdays coming up. But that doesn’t mean we can’t have cake! 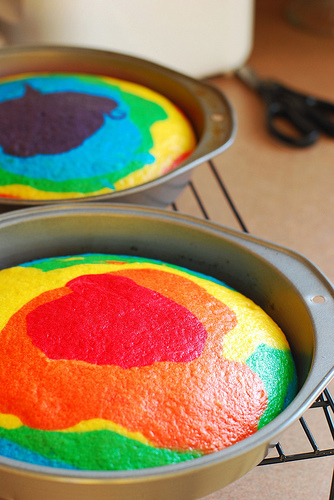 And as long as we are having cake, it might as well be rainbow cake. Am I right? 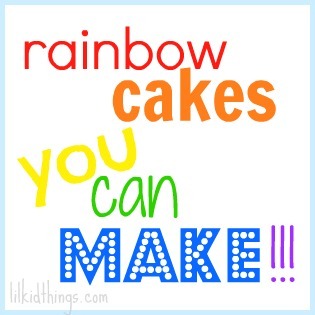 These cakes are more time consuming than they are difficult, but you can’t deny the wow factor when you slice into a rainbow cake. They are just adorable! And people are really so creative in how they package them up. 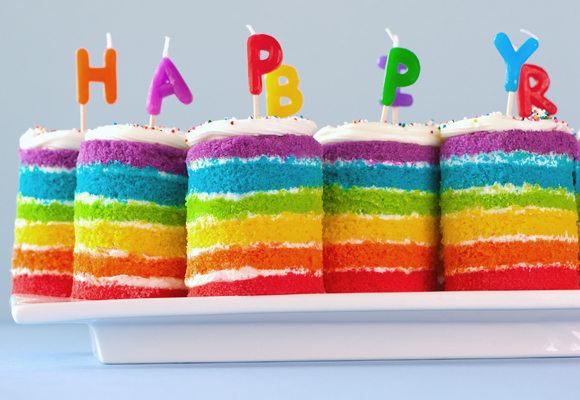 Just look at these 5 rainbow cake ideas and prepare to be amazed. These are probably the easiest of all the cakes. When they are finished it’s a really fun tie dyed effect! Get the recipe on Omnomicon. 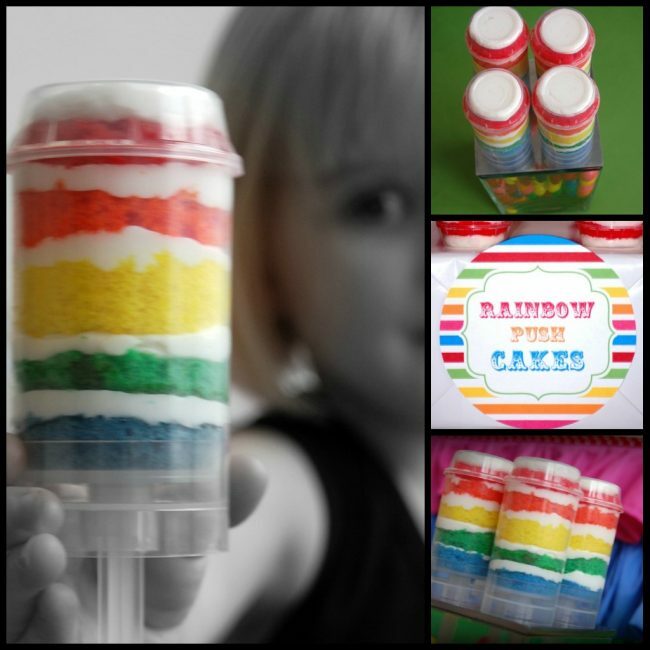 Rainbow to go! These jar cakes would be perfect as a gift or for a picnic. 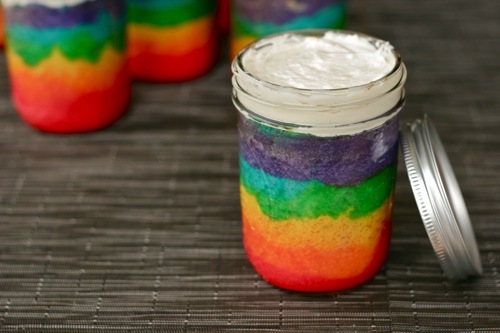 Cake in a jar? Yes please! Learn all about it at Off the (meat)hook. I want these in my belly. Like now. Possibly the most labor intensive of the lot, these mini cakes definitely get a standing ovation from me. I love that the layers are exposed. So fun! Get the tutorial on Rock Ur Party. 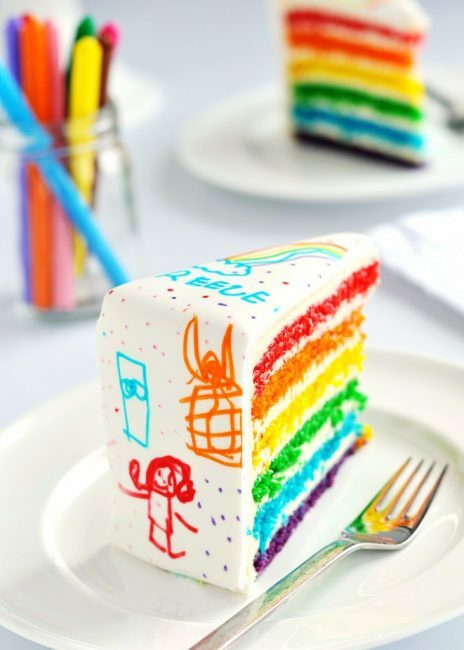 For those of you with kids who are a little bit older, this cake is such a great idea. After making her rainbow cake, this mom added a layer of fondant and set her daughter loose with some food-grade markers. Adorable! Learn how at Sweetapolita. I have heard of push pops, but did you know you can make push cake pops?? It’s totally a thing! And I am so on board. Just look at how awesome these are. They would be so great for a party or picnic in the park. Get the details on Simply Creative Insanity. So now that you have been inspired, I hope you will let me know if you make one of these! Psst….if you are local, I totally accept deliveries. If you like baking you might want to try some donuts too! I LOVE IT!! I made a rainbow cake for my Gracie’s birthday. It… um… didn’t turn out super well. I hope I can make them.